After St. Leo’s parish had been established for about a year, then-pastor Father Andreis realized that a parochial school was of utmost importance in order to succeed in God's good work. Therefore, in September 1882, St. Leo’s School was first opened with three lay teachers. In 1883, the School Sisters of Notre Dame assumed charge, with Sister Mary Margaret as Superioress. The Sisters stayed in charge and untold good has been done by them in giving the boys and girls of St. Leo’s a solid and thorough Christian education. In 1909, when the Pallottine Fathers took charge of the parish, there were 250 pupils on the roll, and had continued to steadily increased. Even in the midst of some parish difficulties, the school had always maintained a high standard. At that time considerable repairs were required in the school, especially to accommodate the increasing number of pupils. 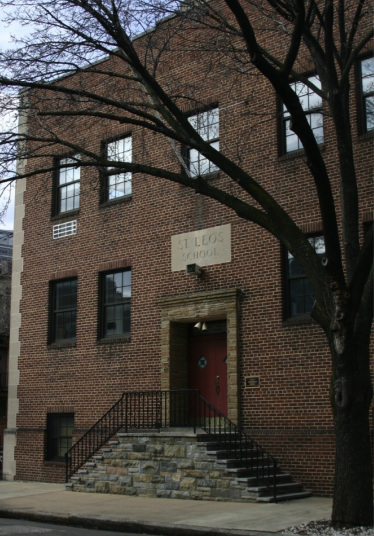 Therefore, in 1910, Father Riedel, then pastor, arranged to have the children taught at St. Vincent’s, 112 N. Front Street, the quarters of St. Leo’s Italian Orphan Asylum. After four years the children were moved back to Stiles Street into a remodeled school, at the blessing of which our late lamented Cardinal Gibbons addressed the people of St. Leo’s and expressed his belief in the future success of the parish and school. The number of students increased gradually and in 1922, there were 252 boys and 229 girls enrolled. The classrooms then had become too small, and were badly in need of repair and modernization. In the early part of 1930, a cry of “We need a new school!” was heard throughout the parish. At a meeting of St. Leo’s Confraternity, members petitioned Father Hector Messina, then pastor, to start negotiations for the erection of a new school and convent. Father Messina, who had been the pastor only for a few months, was somewhat reluctant since he was not yet familiar with his parishioners; but inspired by their enthusiasm, he consented to discuss the idea with His Excellency, Archbishop Michael J. Curley, then Archbishop of Baltimore. Approval was obtained to proceed, and a meeting of the outstanding members of the parish was called to discuss plans and to formulate methods of obtaining the necessary funds. The committee worked out the necessary details and some conducted a door to door campaign of the community. Although discouraging at times, this was overcome by the generous reception they received from the faithful people of the parish. A special meeting was called for the purpose of obtaining funds and to which all of the prominent Italians of Baltimore were invited. Considering the small attendance, the amount pledged was gratifying and encouraging, enabling the committee to proceed with construction plans. Some parishioners made weekly payments, and the young ladies of the Blessed Virgin Sodality volunteered to walk around the neighborhood to collect. The committee acquired additional property adjacent to the school and great effort was made to complete the school during the summer of 1930. School was closed, therefore, during late May, and the buildings were razed, including the St. Leo’s Gymnasium. Due to unforeseen complications, construction was delayed until spring 1931. Work began on St. Leo’s Day, April 11. The children were taught in temporary quarters for the school term of 1930-31. The project’s architect was Cyril E. Hebrank; the commissioned builder was Frank Marino. The new school was ready for occupancy in September without delay. Enrollment began with 400 pupils. NOTE: St. Leo’s School closed in 1980. The building is still actively in use by the parish for various events, and the classrooms are used by the Pandola Learning Center.